A number of things are happening on the golf course so below is your update. I've done this in video format with a little music so enjoy the update. This took a few hours to complete but will be much quicker in the future as I become more familiar with the set up. I hope you've enjoyed the weather as much as we have on the grounds staff. We are beginning to dry a little around the edges but we have been able to hold our water costs well below budget over the first two months of summer which is a good thing. Of course that can change in just a few weeks if the rain stops. I do need to mention a equipment hydraulic leak which many of you might have noticed if you've played over the last few days. Our surround mower which cuts our rough around our greens had a leak in a rear hose. The operator went around 6,8,9 and 14 green before he saw the leak. My hope is that since this is in mostly taller turf, we will have some damage but mostly just leaf die back and no suffocation type damage where the crown of the plant is saturated with oil. The lines were probably less than an inch wide initially but did expand when he began to make some 3 point turns which caused more additional fluid to drop to the turf. I would expect the heat over the next few days to bring the damage out more. If necessary, we will cut out any major loss of turf. We have not completed all tree root pruning on the course but the areas which have been given this treatment are showing good results. A decision was made many years ago to place a tree whose ultimate height could be 70-90' tall only 30' behind the green on #11. The top picture shows the location of the tree and its proximity to the green. 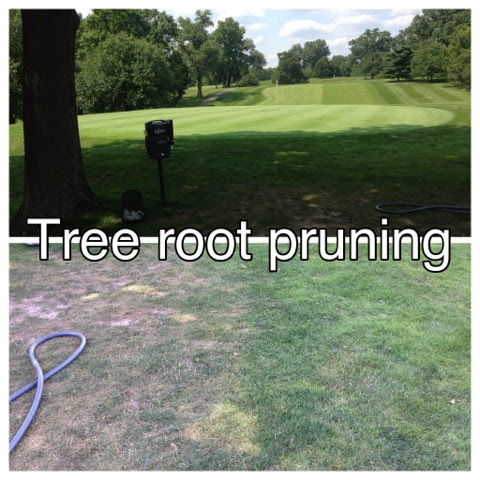 The bottom picture shows the root pruning line that was completed less than 3 months ago. The line was cut between the tree base and the green. It does not take a turf professional's eye to see the vast improvement in plant health and vitality. Great progress on Long Range Tee Today! The staff made some good progress on the range tee today. They were able to get 99.9% of the sod removed. Still have just a little bit along the creek side of the tee to trim away. I fertilized the tee after they left to encourage the Bermuda to grow again and then we will spray it a second time with our mixture of killing material. Hand removing material near sprinkler heads. Pushing in piles and then pushing piles into loader and to the dump truck. Long range tee work is beginning in earnest today with the removal of the first herbicide sprayed turf. Tom pushing dead material into loader which places material in the dump truck for removal. This is the edges of the tee in the tall grass where we intend to widen the tee on the edges and front. As announced last week, the long driving range tee is being converted back to Zoysia which is our main playing surface on fairways and tees. The following information will give you an approximate time table on our plans and what will take place during the construction work. I will post this information in the pro shop and locker rooms. Last Sunday, I sprayed the tee with a 10% Roundup Solution and a high rate of Fusilade II. The Roundup is a non-selective material and kills everything that is green. Fusilade is a grassy weed killer and Bermuda grass is on its label. You need as much help as possible killing Bermuda. After 6 days of Roundup and Fusilade spray. Dying but far from dead yet. In the next few days we will strip the tee of plant material with our sod cutter, fertilize the tee and attempt to encourage the Bermuda to grow again. Once we get some growth back on the tee, it will be sprayed again with the same mix as we did before.We are attempting to get the material into deepest part of the plant in an effort to kill it. I would expect this part of the project to take a minimum of 6 weeks. The regrowth of Bermuda plus the second killing will require some removal of additional turf. During this second removal process, we will install drainage into the tee. It will be perforated 4" pipe with pea gravel creating the drain back fill material. It will be kept about 6 inches from the surface of the tee. The tee surface will then be tilled by our laser level contractor and the exposed trench lines will be back filled with the tilled material. The trenching work should take a day or so to complete. We also have to dig up our sprinkler heads and raise them so that they can be set slightly above grade for sod installation. During the stripping and killing of the tee, we will begin the process of removing trees along with our contractor. I expect to have a majority of the tree work completed before the grass is laid on the new tee surface. Once everything is back filled and ready, the laser-leveling will begin. The tilling and leveling will take about one day. Could till on a day and then laser the next day. Once the surface is prepared and ready, big roll sod will be brought in and installed by our staff. We will also sod the outer ring of the new range tee with fescue, This work should be completed in about 2 days. I would expect that the tee will be completed before September 1st which should given it a chance to root and fill in. Once the tee has firmed enough, we will be filling cracks in the sod with sand to help level these areas and fill in. The tee should be open no later than June 1, 2015 if all goes well. We are evaluating placing some additional netting along the teeing area to help reduce the amount of golf balls lost during the season. We are having discussions with Barrett regarding the best potential course of action to take to help reduce the golf ball loss. June 29th, Sprayed range tee with weed killer. Week of July 7th, remove dying Bermuda grass. Fertilize and water and begin to regrow turf. Meet with contractor and discuss tree removal. 4th-5th week of July, spray tee again with herbicide. Ongoing tree work. 2nd week of Aug. strip off remaining dead material and install drainage. Raise sprinkler heads in preparation for leveling and sod work. Make changes in sprinkler alignment if necessary. 2nd week of Aug. finish tree work. Install any additional netting around range tee due to lack of access after it is sodded. Any netting along the line away from tee can be installed later in fall. Lay sod on and around tee after leveling is complete. September 1, watch it grow!! 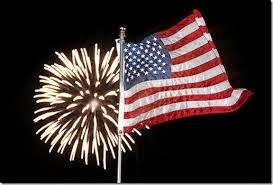 Its a great weekend here at Glen Echo for the 4th of July. A great deal of activity at the club all weekend centered around golf but we also have the pool party and Barbecue set up for Saturday afternoon and the Dinner that evening with some fireworks to cap off the night. Weather is perfect so come on out and play, eat and drink this weekend at Glen Echo. Years ago, our family would gather every year at my Uncle Clarence's farm in Advance MO for a huge party. Usually 60-80 people. We would play softball in the field trying to avoid the cow piles, eat some great food and shoot off a bunch of fireworks. I remember one particular year because of what was barbecued. The winter before we had visited friends in Dallas over New Years and was actually driving back from Dallas the year of the Ice Bowl Game in Green Bay when dad hit a Raccoon about 30 minutes from our house. Picked it up off the road, yes we were a little bit country, cleaned it and put it in the freezer for future use. Well that use came on the Fourth of July that next summer and there was old Raccoon on the grill for the 4th. They said it was good, don't think I tried it even though as a young boy we at a lot of game for our meat source during some pretty tough years. Anyway, if its not a Raccoon or other wild game your eating, hopefully its a nice juicy pork steak, brat or any of the other great holiday treats Hopefully you get to spend some time with family and friends enjoying the freedom that we have been given by so many since the formation of this great country. As you walk into the members entrance, there is a bed to the left that was planted with ivy and vinca vine. 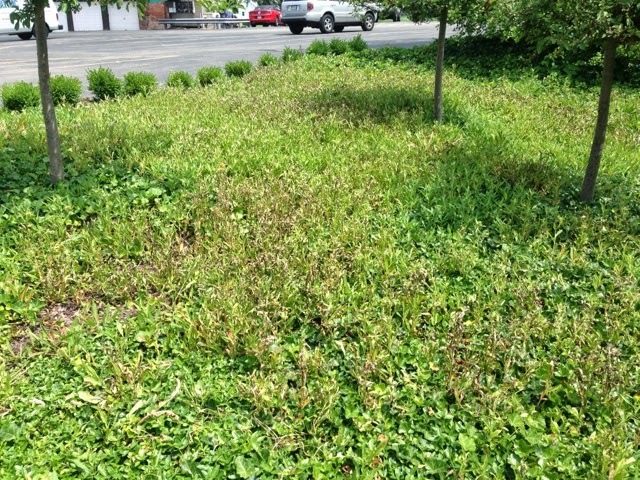 Before construction of this area in 2012, there was an invasive weed that created issues for us. When the beds were reworked, the weed of course was still alive. It came up with a vengeance this season. Too many to hand pull because once you pulled out one plant, vegetative parts were still in the ground which would then sprout. We decided to spray over the top to chemically kill the weed. It will probably ding the vines slightly but they should recover. Becky allowed the weed to grow over the ivy and then lightly sprayed the weeds. Lady and her Mockingbird friend near the practice green. I'll have an even better video tomorrow if she comes to work. She worked real hard today so I'm not sure if she will make it.